Now that I finally have this book and am reading it (the volume also contains On Interpretation and Prior Analytics) I am consumed with the fear of forgetting. Having finished Categories in a careful and deliberative fashion, I still feel that I will move on to the next and remember almost nothing of what preceded it. 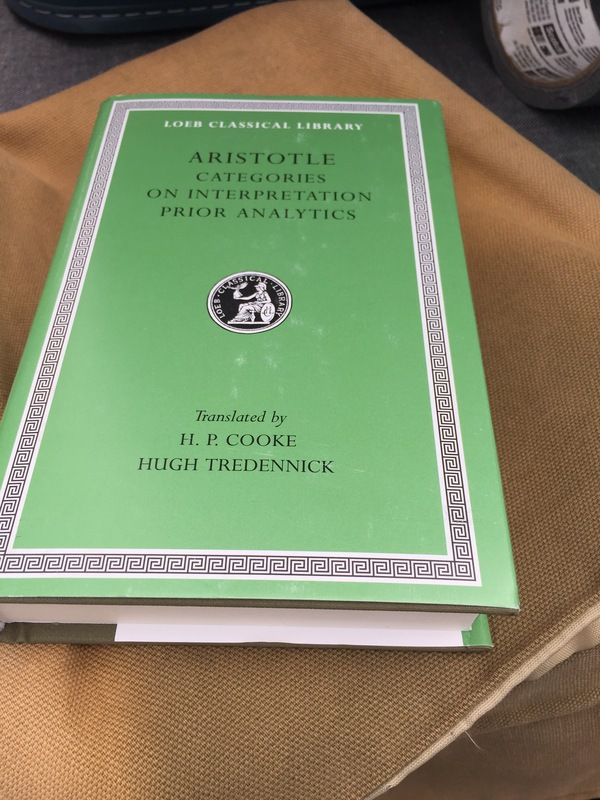 I minored in philosophy at college and still read it for pleasure, but while logic was my favorite branch at college, it is a right pain to read later in life, no matter how useful (and make no mistake; studying logic in college was incredibly useful; if you are in college, I highly encourage you to take a couple of logic courses, because it will give you a new and valuable perspective on things). Alas, but I may still hope to retain something and the peripatetic master has forced me to consider the meaning of the things I say (though I wonder how many of his categories were inspired by ancient Greek’s declining nouns? ).